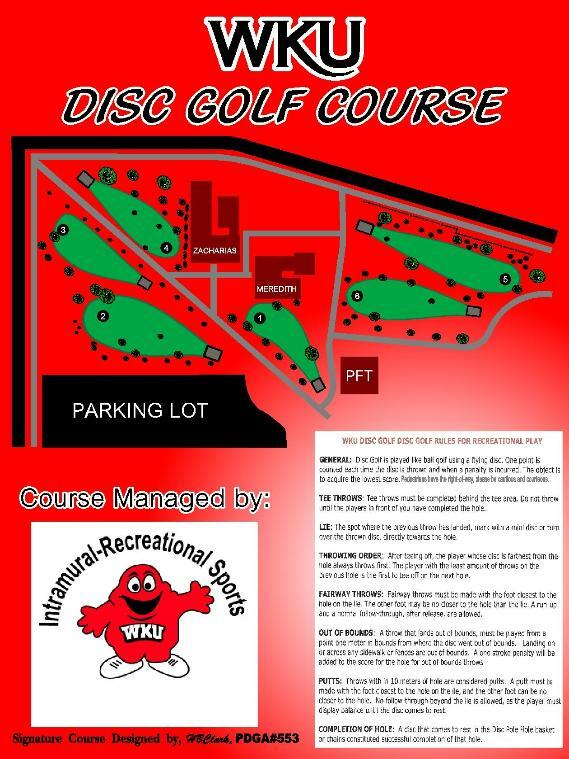 Short urban course with a couple of challenging holes. In open and wooded area near dorms. All sidewalks and beyond OB. Follow signs to WKU from any interstate, look for tallest bldg. - the 27 story dorm. 1st tee just to left side of dorm. Parking lot off Normal Dr. has some meters, or park across University Dr. and walk. Well, it is a disc golf course, but not much of one. I live near campus and went to play with my friends, though we could only throw two holes for all the students walking around. This course meanders all over sidewalks, and the tee pads are right next to the dorms--it looks like they just squeezed the holes in between them. I don't think I'll be playing this course much if at all in the future.